Azehur, Firaqa, the Rankan Empire, the Kingdom of Ilsig and more have resonated in the stories and deeds of the famous heroes and villains of Sanctuary. 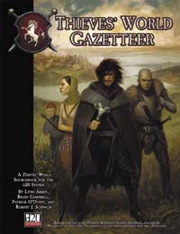 The Thieves' World Gazetteer presents all new information on the world of Sanctuary, expanding the focus to reveal the peoples and places in the Known World. From the Cold Lands in the northeast to the Gate of the East, Mrsevada, the Thieves' World Gazetteer is packed full of information. In addition, this volume includes extensive details on the gods of Thieves' World, a comprehensive history, and a discussion on the cosmology and planes, along with a slew of new cultures, backgrounds, and other supplementary information. With the Thieves' World Gazetteer, Sanctuary is just the beginning of a larger world of adventure! Sign in to start a discussion about Thieves' World Gazetteer (d20)!